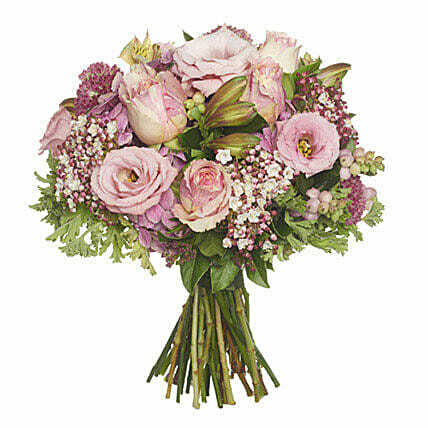 Get your amazing bouquet of pink flowers consisting of roses, peony, viburnum, alstroemeria, freesia and hydrangea that together makes for a stylish and elegant combination. The beautiful bouquet is sure to impress your loved ones and stands for admiration and gratitude due to its characteristic pink colour. Order it now for your dear ones. Although we try not to, occasionally substitution of flowers is done due to temporary and/or regional unavailability issues. Please be noted that we may have to do this without informing you because we give utmost importance to delivery on time since most of our orders are gifts for a certain occasion.